Logical structure of a database and fundamental determines in which manner data can be stored, organized and manipulated. Data is organized in tree like structure, implying a single parent for each record. Allows many to many relationship in a graph like structure that allows multiple parents. Organise data using two fundamental concepts called records and sets. Collection of tables to represent data and the relationship among those data. Eg: Oracle, Sybase. Data and their relationship are organized or contained in a single structure known as object. 1)Entity: It is "thing" or "object" in the real world that is distinguishable from all other objects. An entity has a set of properties and values for some set of properties that may uniquely identify an entity. Collection of entities all having same properties or attributes. 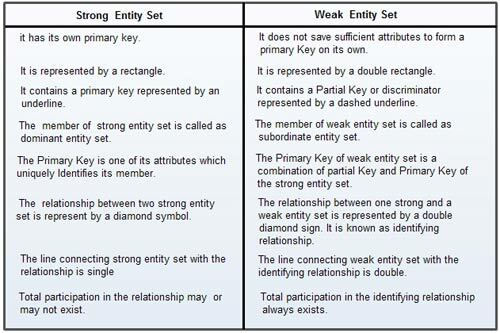 Each entity is described by set of attributes/properties. Attributes are descriptive properties possessed by each member of an entity set. For each attributes, there is set of permitted values called domain or value set of the attributes. 2)Composite Attributes: Divided into subpart eg: Name is divided into first name, middle name and last name. 4)Multivalued Attribute: More than one value for a particular entity eg: Phone No. Null Values: Entity doesn't have value for the attribute.